I made these to go on a wedding cake that I did over the weekend. They took a little time between steps, but overall I thought that they were really easy to do. I will definitely be doing them again! To get started you need fondant of your choice color (mine was white) and roll it out thin. I cut my ’tiles’ out before stamping them, but if I do it again, I think I would stamp and then cut… I will have to try it out and give you guys an update. 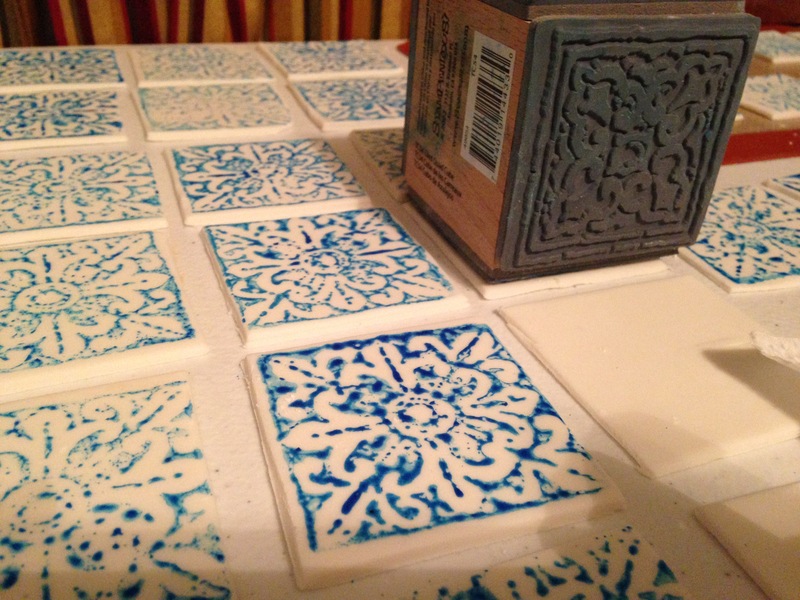 I used a mixture of food coloring, water and powdered sugar for the stamping. 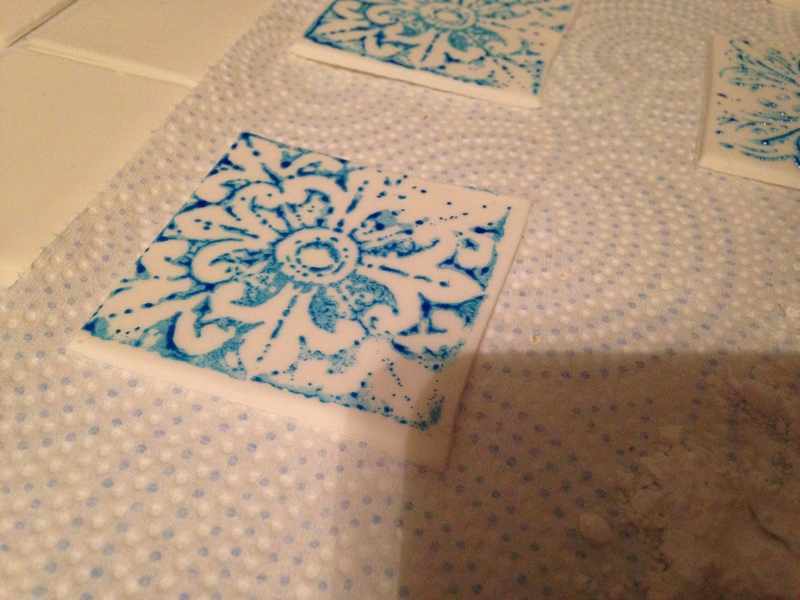 I mixed it up fairly thick so that it would evenly coat the stamp. I found with just using a water/color mixture it beaded up on the surface of the fondant which was definitely not what I wanted! Looking back at this I think I would also substitute vodka or an other strong alcohol for the liquid to speed up the drying time. 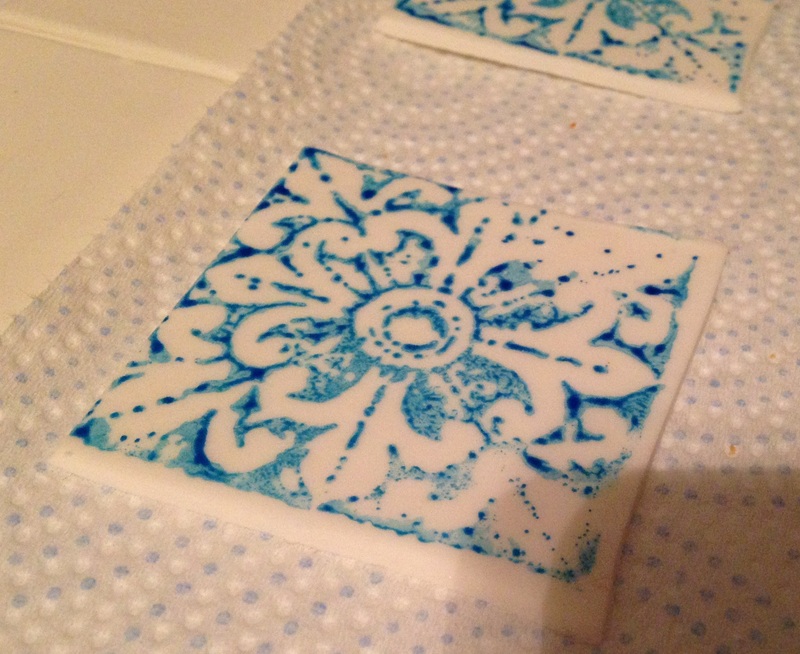 Wash a clean unused stamp and dry. Then just brush on your color mixture with a clean unused paint brush. It stamped fairly evenly on most of them. The only problem I ran into was that some of my fondant had small dips in it from where it wasn’t rolled out super evenly, I liked the way that it looked slightly varrigated. After the color dried they were ready to put on the cake! You could put it on cookies, do rounds and put them on top of cupcakes, there are so many options to use these! 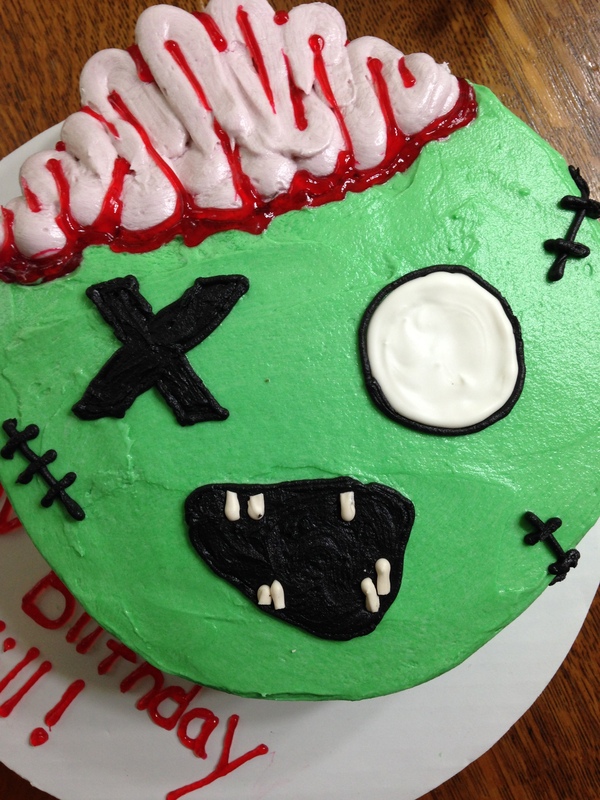 Made a cute zombie cake for a young boys birthday over the weekend. Got to practice my blood making skills (ewwwwwwie). But seriously, this stuff was AWESOME! It made a bright red pipe-able (is that a word?) gel and it did not take any special ingredients whatsoever. Mine dried to the consistency of jello, however, you could make it thinner for blood spatters (eww) or let it set some before piping to give it a different consistency overall. I will share the recipe below though so you can make your own awesome cakes with this gel. It could be used for other things as well like blue for water! Stir together ingredients in a microwavable bowl. Heat for 1 minute and 30 seconds or until mixture boils. Remove from microwave and stir with a whisk. Add desired colors! You can also add in some vanilla or other flavor if desired.